Bucks Split With Hawks: A Spectacular Game…A Disastrous Inning! Prosperity seemed to smile on the Buckeyes as they parlayed their best starting effort of the season into a 2-1 first game win. Then a first inning lapse in the second game cost them a possible sweep of Saturday’s doubleheader with Iowa. 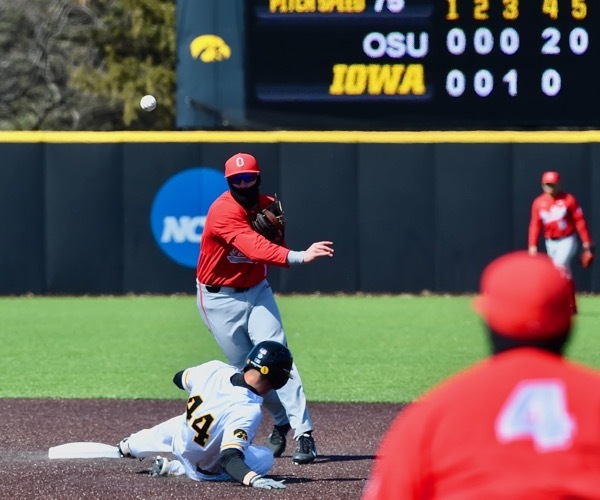 Iowa City, Iowa – It will go down, officially, as a routine split of a doubleheader – Ohio State taking the first game of Saturday’s twin-bill with Iowa 2-1, before dropping the nightcap 9-5…on a cold, windy day more suited for waterfowl hunting than baseball. But, it could have been so much more! More, because in the first game lefthander Connor Curlis gave the Buckeyes their best, most efficient starting effort of the year. Curlis went the first 6.2 innings to gain his fifth win, giving up just one run on six hits, striking out eight and walking two. Then, the inevitable Seth Kinker came on with one out in the seventh to pitch 2.1 innings of scoreless, two-hit baseball to gain his seventh save of the season. Curlis (5-1) was spectacular, in a word – dominating! He pounded the strike zone, pitched ahead in the count, and mixed his pitches well enough to have an aggressive Iowa batting order well behind his fastball…and well ahead of his off-speed pitches. Offensively, Curlis got all he needed in one inning after giving up a single earned run in the bottom of the third. 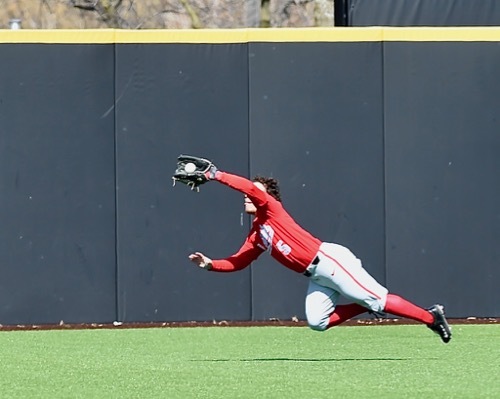 Malik Jones makes a dving catch to rob an Iowa rally in the bottom of the sixth. Noah McGowan started off the fourth with a double to left. Conner Pohl advanced him to third with a ground ball to second, and then Tyler Cowles rifled a single to left to tie the score at 1-1. Catcher Dillon Dingler lifted a deep fly ball to center that the Hawkeyes’ Justin Jenkins dropped, allowing Cowles to advance and Dingler to reach first base. Jacob Barnwell then came to the plate and promptly lined a ball to center for another hit that pushed Cowles across with what turned out to be the winning run. 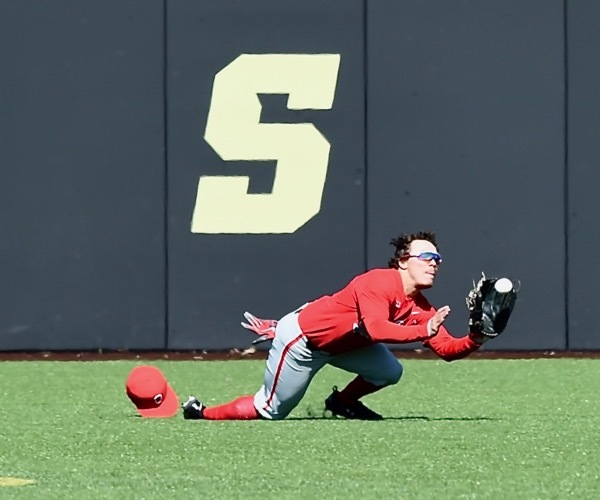 But defensively, the Buckeyes played contrary to their recent adventures afield, with a pair of sparkling plays in center by Malik Jones – one to the gap in left, and another towards the gap in right – and a key 6-4-3 double play that Brady Cherry turned to squelch a would-be Hawkeye rally in the fifth. In fact, every time Iowa would rattle Curlis’s chain, he seemed to find a way to kill any thoughts of a rally. In the first, for instance, after a dropped pop-up at second base by Brady Cherry, and a single to right by catcher Tyler Cropley, Curlis promptly struck out the side. And in Iowa’s lone scoring inning (the third), after a Chris Whelan double and a run-scoring single by Cropley, Curlis again pitched himself efficiently out of the inning to limit the damage to that single run. The line score: The Buckeyes won it with 2 runs, on 8 hits, and committed just one error. The hitting stars were Kobie Foppe (2 for 4) and Tyler Cowles (2 for 4) accounting for four of their eight hits…while Barnwell, McGowan, Dom Canzone, and Conner Pohl each had a hit apiece. Iowa, in losing, had 1 run on 8 hits and likewise, committed one error. Seth Kinker did what he does best – 2.1 innings to 2 hit baseball (4 strikeouts) to earn his seventh save. On day where the temperature never got above 36 degrees, and the wind chill barely got above 28, the momentum appeared infectious – sure to carry over – as the two teams came out for the start of the second game. 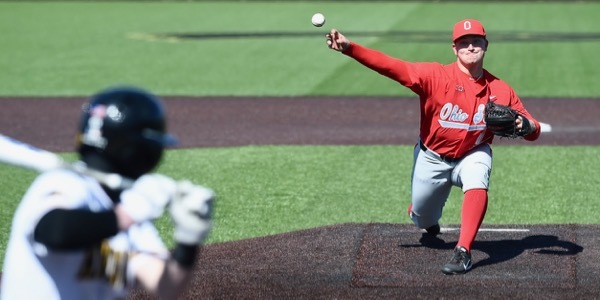 But one disastrous inning – the first – proved to flip it all in the matter of a half hour as the Hawkeyes batted completely through their order in the bottom of the first. It started well enough. In the top of the first Dom Canzone walked, Kobie Foppe sacrificed him to second, and after a Brady Cherry strikeout Noah McGowan punched his second double of the day to score Canzone to take the early 1-0 lead. But in the bottom of the first…with Ryan Feltner on the mound seeking his fourth win of the year, designated hitter Chris Whelan hit the first strike he saw to shortstop Kobie Foppe and Foppe short-hopped his throw to first base. Noah McGowan, who had made one good play after another in game one, could not corral this one and the lead-off error started an avalanche. OSU’s Conner Pohl shows his frustration during the first inning of Iowa’s 9-5 win in the second game. Robert Neustrom singled to right. Tyler Cropley singled in the hole between short and third. First baseman Austin Guzzo then singled off Pohl’s glove at third, scoring a run. Third baseman Lorenzo Elion singled to left to score another run. With the bases still loaded, centerfielder Justin Jenkins walked to make the score 3-1. Left fielder Ben Norman hit a sac fly to left to score a run…4-1. Second baseman Mitchell Boe single to right to score another run…5-1. And then Whelan, batting for the second time in the inning, hit a two-hopper to Pohl at third, who short-hopped it to first, allowing two more runs to score (7-1) and effectively seal Feltner’s, and the Buckeyes’ fate. In all, the seven runs were the biggest inning allowed thus far through 29 games. And worse, five of them were unearned! And, it took the lustre from a day that resulted in a split with a fine Iowa baseball team – a day that featured three doubles by Noah McGowan and four hits in eight at bats on the day…another three for seven day for Tyler Cowles…and another three for seven day for Kobie Foppe. 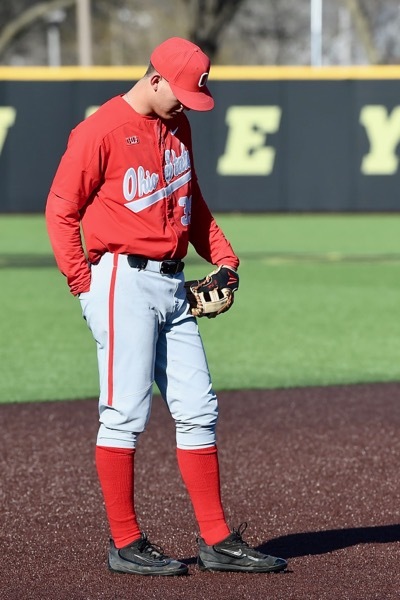 The line score of the second game: OSU had 5 runs on 10 hits and committed the two errors in the first inning – while Iowa scored 9 runs on 8 hits and committed one error. It detracts from what could have been another fine effort from Ryan Feltner, had he not been forced to labor as he did in the first inning. And it detracts from a nice relief effort by Austin Woody and Jake Vance, who combined to pitch four innings of two-run, two-hit baseball, striking out five. But most of all it subtracts from what might have been the 21st win for the Buckeyes (now 20-9) and 4-1 in the Big Ten (the Buckeyes are 3-2). And, it sets up another conference rubber game on Sunday for the second week in a row – before an anticipated snow storm hits. Start time Sunday is 1:05 eastern time. Senior co-captain Adam Niemeyer (2-2, 5.85 ERA) gets the start for the Buckeyes. Iowa will counter with junior righthander Cole McDonald, (2-1, 3.52 ERA). Malik Jones makes the second of his two fine catches in Saturday’s 2-1 over the Iowa Hawkeyes. 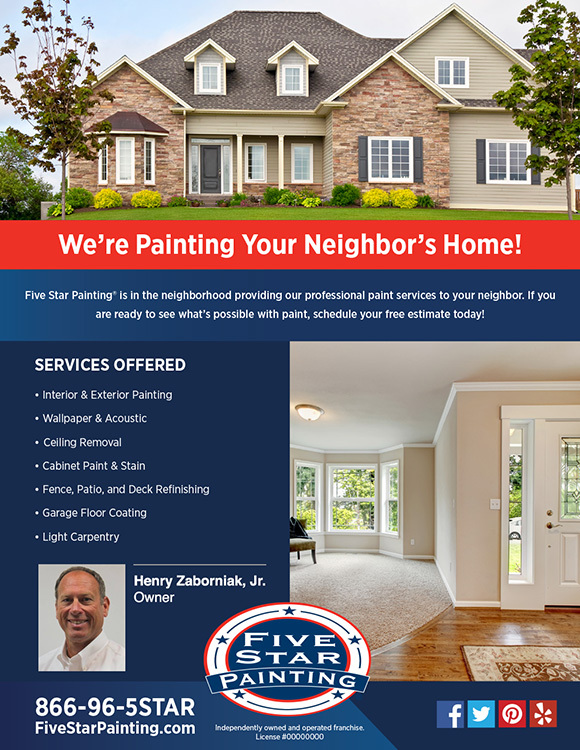 Five Star Painting, in Pickerington, is proud to sponsor baseball on Press Pros Magazine.com.